Moving at any time of year can be a challenge, but most significantly during the winter months. From frigid temperatures to inclement weather forecasts, additional considerations must be included in every winter moving project to prevent delays and ensure success. As you plan for your winter move, be it residential or commercial, try to use the following tips to expect the unexpected. Making certain the utilities in a new location are operational is a common oversight. Light, heat, and power are huge necessities in the winter months. Whether your new residence uses electric, natural gas, or oil heat, (coupled with running water), if the utilities are in good working order, your new location should be warm and accommodating when everything arrives. Safe access to the home is a prerequisite to a safe and successful move. Regardless of the amount of precipitation in the air or on the ground, plan ahead to clear walkways as needed and cover slippery spots with sand and/or salt. Also, keep shovels and extra bags of de-icing material handy should the temperature drop and cause heavy traffic areas to become slick. Watch those road conditions and weather! Winter months are notorious for unpredictability, so expect delays and have alternate routes mapped ahead of time. Be sure to have a contingency plan, too, in case your moving project experiences an unforeseen weather-related problem. Don’t forget to coordinate with your moving company, as well. Stay in close contact with your movers once the process begins -- especially if Mother Nature is uncooperative. Make use of a moving checklist! Depending on outside temperatures, it is imperative to check, then double check, for items that are sensitive to cold. Try using our ultimate moving checklist to make sure you are adequately prepared If anything could be harmed by frigid temperatures, use extra packing materials and insulation to transport your item. Or, if possible, take the item with you in a heated vehicle. Be aware that if a delay occurs, some of your possessions may end up spending additional time in the moving truck. With so many concerns added to a winter moving project, increasing one’s stress should not be a consideration. Much of the anxiety associated with the planning and execution of a moving project can be alleviated by using a reputable moving company. Leave nothing to chance. Your peace of mind is well worth the investment, as is the overall safety of your possessions. Whether moving across town or across the country, Oz Moving & Storage has been New York City’s leader in residential and commercial moving for over two decades. Fully insured, competitively priced, and with an unwavering commitment to customer satisfaction, we offer a variety of moving and storage services for our clients. 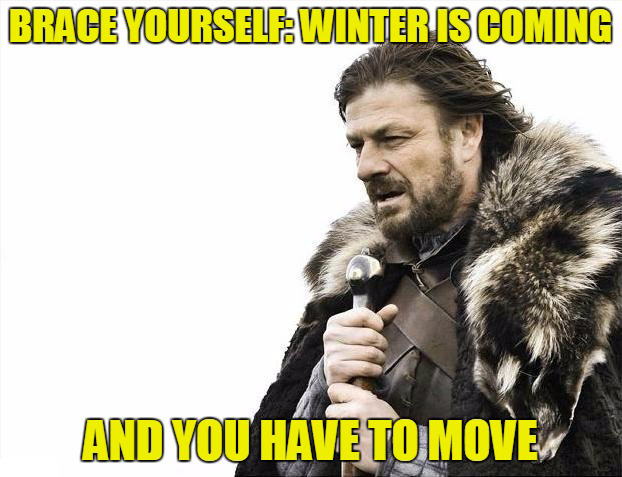 Winter, spring, summer, fall … Oz Moving & Storage does it all!